Summer may be coming to an end but the movie fun keeps going. There are lots of fall movies scheduled this season in Nashville and Middle Tennessee. 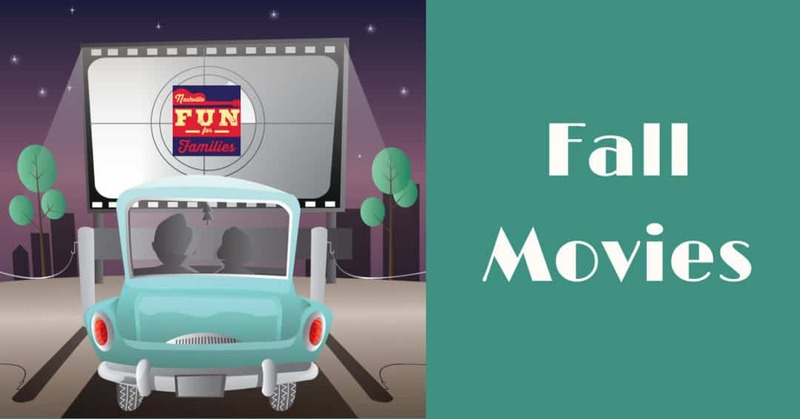 Find a Movie in the Park event for Autumn evenings or a traditional indoor movie for days when the weather doesn’t cooperate. Find tons more fun in our 2018 Fall Guide. First run movies every weekend through the November. Check their site for movie selections and dates. Box office opens at 6PM. Don’t forget your blankets if you plan to sit outside your car to watch the movie. Hot days turn into cool evenings this time of year! Concessions are available. You may also purchase a ‘food permit’ for $6 per car in order to bring in outside food. Cash & Credit/Debit cards are accepted at the box office and concessions. First run movies every Friday, Saturday & Sunday night. Open , weather permitting through October. Concessions available. Debit cards accepted for concessions. No outside food or drinks allowed unless you purchase the $5 permit at the box office.